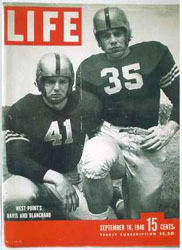 They were the 1940’s version of the dynamic duo, with each earning a Heisman Trophy. One in ’45; the other in ’46. In their three years together at West Point, the Cadets didn’t lose a game, going 27-0-1, and winning back-to-back national championships. One was a powerful, bulldozing fullback; the other, a fleet-footed and ankle-breaking halfback. To their teammates and coaches they were simply Glenn Davis and “Doc” Blanchard. But to admiring fans everywhere, they were better known as Mr. Inside, Mr. Outside. Their legend begins in high school where both were stellar athletes in a variety of sports. Davis was a 13-letter sport star at Bonita High School in La Verne, California, while Doc starred at St. Stanislaus Prep in Bay St. Louis, Mississippi. Each came to West Point by way of circumstance.